Institute for Molecular Engineering researchers have developed a “lab-on-a-chip” that could help us understand how single stem cells react to different molecules and environments. Credit: Zhang et al. Researchers with the Institute for Molecular Engineering at the University of Chicago have developed a new "lab-on-a-chip" that can examine thousands of individual live cells over a weeklong period, performing experiments that would take more than 1 million steps in a laboratory. 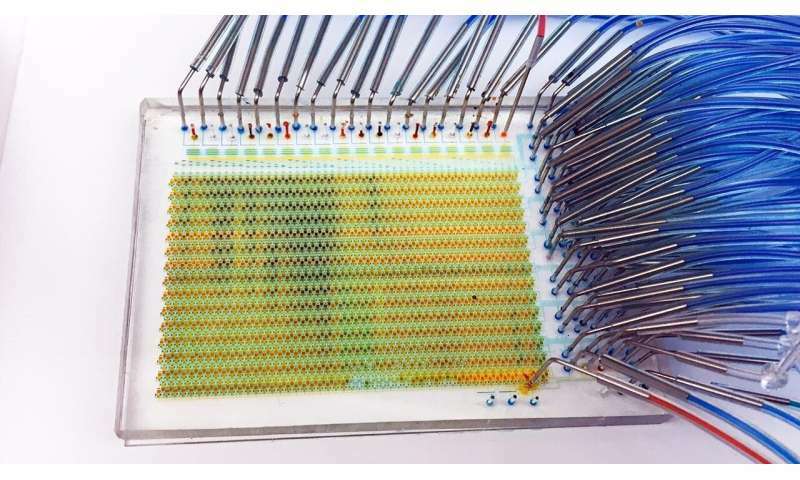 "We wanted to develop a microfluidic device that could sort, image and culture single cells in an automated, high-throughput way," said Assoc. Prof. Savas Tay, lead author of the research, published April 3 in the journal Science Advances. "We achieved that, and now we have an understanding of how stem cells make decisions. That's pretty exciting." Finally, the device also can keep cells alive for much longer, thanks to a new technique of diffusing media into a cell culture. Normally, to keep cells alive, researchers must change the media they are kept in every few hours. This change shocks the cells, and after several shocks, the cells can die. The researchers' new technique diffuses the media into the cell chamber, a gentler process that does not shock the cells. "There are certain orders of signals that are highly optimal, and the exact timing of signals matters," Tay said. "There hasn't been a way to dynamically monitor these cells before, so finding and understanding these principles is exciting." Ultimately, a device like this could be used in fields like immunotherapy, where a patient's own immune system is stimulated to help fight disease. A patient's stem cells could be removed, placed into the device and be given the right combination of molecules to develop them into a certain lineage, then be placed back in the body. "We want to be able to use this device for all kinds of problems in cell biology," Tay said. Other authors on the paper include Ce Zhang and Hsiung-Lin Tu, former postdoctoral fellows in Tay's lab; Gengjie Jia, a postdoc in the Rzhetsky lab; and Verdon Taylor and Tanzila Mukhtar of the University of Basel.